Trucks and trailers provide an excellent opportunity to advertise your business. Even more than the standard size vehicle wrap, the large size of the surfaces involved with trucks and trailers add more exposure to a greater number of customers on a daily basis. Trucks and trailers take the “moving billboard” concept and make it even more literal. The large, relatively flat surfaces of the truck and trailer bodies provide an unbeatable opportunity for advertising that stands above the rest. The price of the truck and trailer wraps, much like those of the typical truck wraps vary with coverage size and complexity of the installation. For a detailed quote, contact a Kranken Signs Vehicle Wraps representative at 704-339-0059 . We are happy to discuss the project with you and determine the best solution for your truck or trailer. We invite you to explore the rest of our website to learn more about Kranken Signs Vehicle Wraps and see for yourself what our vehicle wraps and Truck Wrap Decals have to offer to your company. At Kranken Signs Truck Trailer Wrap Services, much like the smaller vehicle wraps, the process of wrapping a truck or trailer graphics is similar. The first step is creating artwork for the project. Our experienced designers can give you an impressive graphical look, or you can supply art from another designer to the exact dimensions we provide. Production is the next step, and involves printing the artwork onto 3M vinyl material using a specialized wide format inkjet printer. Finally, installation is done at either our facility or off-site at your location. Installation is highly skilled and time consuming. We generally try to coordinate installation in such a way as to minimize disruption of your schedule as much as possible. Vinyl adhesive is the method, like other types of Enclosed Trailer Graphics, in which vinyl material is overlain onto the vehicle surface. This generally has a longer lifespan and is the more common type of installation. This takes approximately 8-10 hours and is performed by our experienced installers. 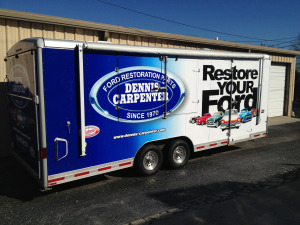 A trailer skin is a non-adhesive based vinyl covering that is designed to slide into a frame installed on the sides and rear of the truck or MX Trailer Graphics body. These skins are ideal for clients who are inclined to change their message and advertisement look periodically and want to minimize repeat costs. Installation usually takes about an hour to complete, and is capable of being performed by the customer’s staff if desired. We are committed to giving our clients the best possible service, using the finest materials, and with the highest quality installation at the most affordable rate possible. We guarantee that we will match any verifiable competitor’s quote on a similar vehicle wrap. * In addition, we will beat that quote by $100 –providing even more value for your marketing dollar. Our wraps are the best that money can buy, and we are confident that our product is right for your business. For that reason, we offer our low price guarantee – so that there is no doubt we have only the best in mind when it comes to our client’s needs. Call 704-588-2555 for more information on our low price guarantee and how we can get started today on your vehicle wrap.